We love pizza in my house. My son likes to make his own pizza. We make thin crust, thick crust, calzones, and a casserole. This is fun, easy and versatile. Topped with spicy chunky sauce, and lots of veggies, it is pizza heaven on our plate. Start with the Pizza Crust and Sauce recipe here. Get you some Almond Cheese. You can buy it, make it- whatever you do. 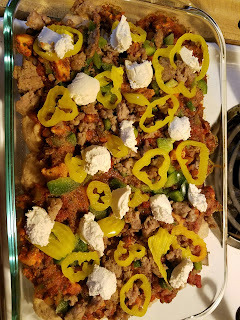 Try this recipe, it is super easy (TIP: you need to make this ahead of time, NOT the same day you want to make pizza). You will need 1 1/2 cups or so. Chop some veggies- bell peppers, onions, banana peppers, tomatoes, mushrooms. Whatever you like. Chop some fresh herbs- basil, thyme, oregano, parsley. Brown some sausage if you like it- chicken or turkey. Or use grilled chicken, if you like. Grease a 13x9 baking dish with olive oil. With oiled hands, pinch off small bits of the pizza dough, and roll between your palms to make a ball. You want them smaller than a ping pong ball. 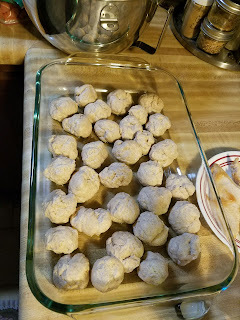 Place the dough ball in the baking dish. Do this will the entire batch of dough. Cover the bottom of the dish. The balls do not have to be touching, if they do it is fine. Cover with damp towel and put in warm spot and let rise a second time, until doubled. Bake the balls in a 475 degree oven for 8 minutes. Remove from oven. Spread the pizza sauce on top. Top with the almond cheese (crumble it if it isnt creamy. Or spoon small amounts in blobs all over the sauce.) Top with the veggies, sausage, grilled chicken, herbs, whatever toppings you want to use. Bake the casserole for 15-20 minutes, until the toppings are hot and golden. Remove from oven and let cool for about 5 minutes. 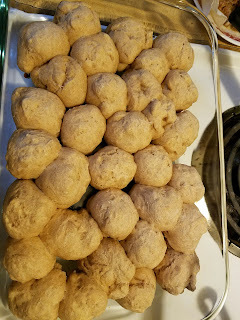 For p3, my pizza crust recipe makes 24 grain servings. If you use the entire recipe for your casserole, 1/24th is a standard portion of grain. 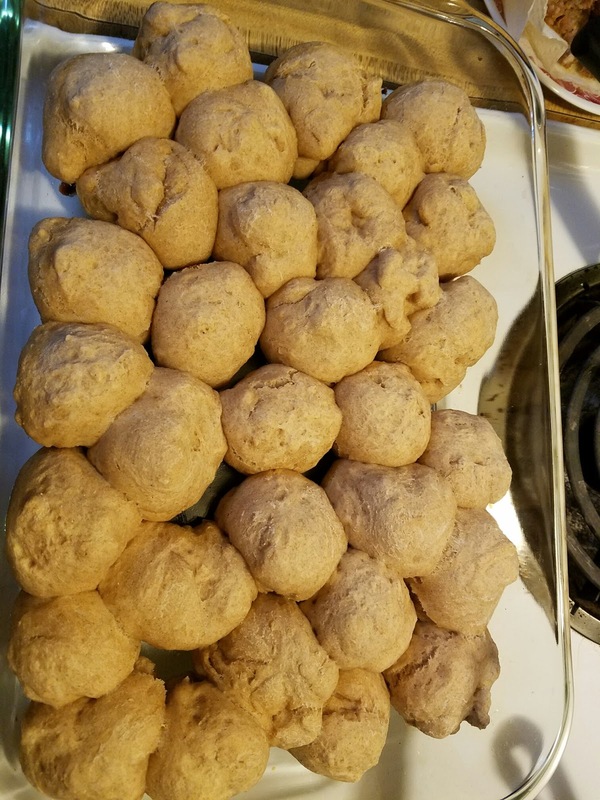 I typically use half a batch of the dough, so a large 13x9 casserole is 12 standard servings. 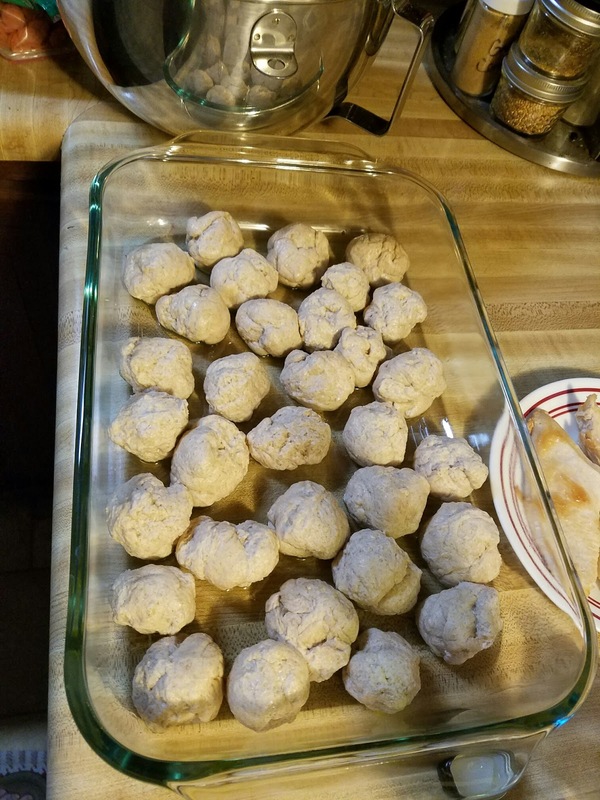 Now, since the casserole makes 12 servings, you probably won't want to have 48oz of meat on there, so, serve this as a side dish. Either leave the meat off and make veggie pizza casserole, with protein in the side, or use half the protein on the casserole and the other half on the side. Serve with large salad with protein, or a nice hot bowl of soup with protein in it. A nice hot bowl of minestrone with beans sounds lovely. Would goat cheese or feta be acceptable? Can you use a different flour, not wheat?